Despite some hints that the Air Force’s tiny re-usable space plane, the X-37B, would be returning to Earth after a long, secretive mission, it looks like that’s not the case, and the little shuttle will continue to circle the globe, conducting its devious, secret little experiments. 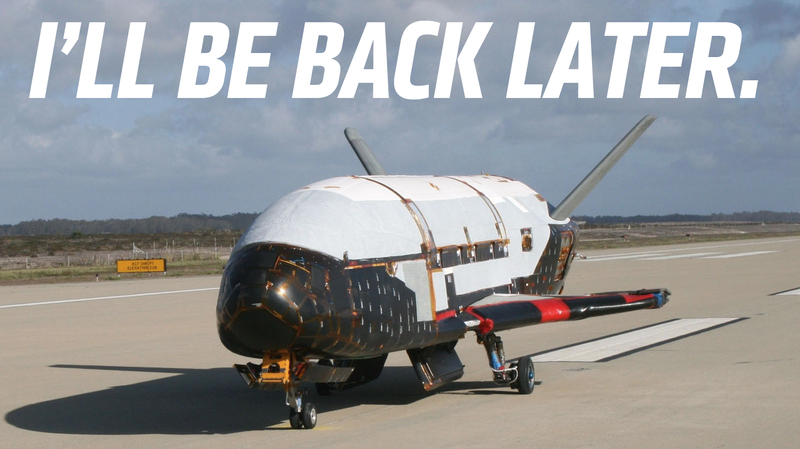 The last mission for the X-37B was 675 days, so we’re not even in record territory yet, but that may still happen. This is only the fourth actual mission of an X-37B (there’s two of them), but since those missions tend to last so long, the spacecraft has amassed a pretty impressive record for time in space. I’m not exactly certain, But I suspect that the X-37B has spent more time in orbit than the Mercury and Gemini programs combined, even. As for what the X-37B is doing up there, nobody outside of the Air Force really knows, but we can make some guesses based on past missions. Testing new space hardware and technologies is likely, like the Hall-effect thruster that we learned about before this mission launched. If it’s actually using the Hall-effect thruster to help maintain orbit, it’s possible the mission length could be even longer than before, since limited propellant supplies would not have to be taxed as much. Perhaps they’re doing research for a possible manned follow-up to the X-37B? Perhaps it’s surveillance, or maybe autonomous spaceflight software testing? Who knows what it’s doing up there. But it’ll be up there doing it for a while longer, it seems. Is The Air Force&apos;s Secret Shuttle The Key To Russia-Free ISS Trips?